I began this series by disagreeing with a footnote in Laurence Hemming's Liturgy as a Revelation (if you haven't read it, you should. It's a fresh and revolutionary exposition of the Tradition). He described how the newly ordained, in the Mass of their Ordination, vested in all the garments of the priestly celebrant, say the Canon, including Hoc est enim Corpus meum and the rest ... and claimed that this had nothing whatsoever to do with Concelebration! With regard to this footnote, I am reminded of the description by the immortal Edward Frankel of one of his predecessors in the Corpus Chair of Latin: 'A man viz a remarkable instinct for ze improbable'. Perhaps it is worth adding that, in the old Pontifical, the neo-ordinati even recited the Offertory Prayers ('Receive, O holy Father, almighty everlasting God, this spotless host, which I thine unworthy servant, offer unto thee ...). If they were not concelebrating, their behaviour was very weird and their words and garments peculiarly misleading. It is the practice of the simultaneous recitation of the Eucharistic Prayer which seals and guarantees the reality that these presbyters are severally as well as corporately offering the Holy Sacrifice, and not merely occupying a pompously elevated position in the Sanctuary. It teaches that the Priesthood is not only a corporate charism but also a deeply personal one, indelibly imprinted on the soul of each priest. Priesthood is not only a necessary function in the Body of Christ; it also defines and structures how the priest is a Christian. I know that among Byzantines, in some places the concelebrating priests to not join in the Prayer, but our Western practice is deeply fitting. Moreover, it states that a priest concelebrating is doing exactly the same thing as a priest saying a Private Mass, and thus in turn defends the wholesome Western tradition of the Private Mass. Those are to be resisted who dislike both Concelebration and Private Masses on the ground that the Priesthood is merely functional and utilitarian. As one goes down this path one's ultimate destination is the Protestant heresy that the community may commission any one of its members to discharge this function; a heresy not unknown among liberal Roman Catholics. 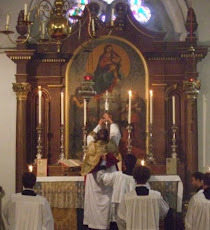 Unlike some, I believe that both Concelebration and the Private Mass are precious and profoundly edifying gifts from God in our Western tradition. I believe that we need to develop a new praxis with regard to the godly and sensible use of both of these within our priestly ministries; and that, in this regard, the generation since the Council has been a generation wasted.